According to La Sportiva’s Facebook page Paige Claassen did the FFA of God’s Own Stone (5.14a) at the Red River Gorge. 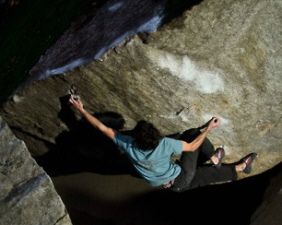 According to his 8a scorecoard Lucas Ménégatti repeated Dave Graham’s The Island in Fontainebleau, France. Originally graded V15 by Graham, Ménégatti and a few other recent repeaters like Michele Caminati are suggesting a grade of V14 for the problem. A bit old but still worth mentioning was the Czech Republic’s Radovan Souèek doing the 3rd ascent of From Dirt Grows The Flowers, a Dave Graham V15 in Chironico, Switzerland. The problem apparently saw a 4th ascent by Brit Micky Page in recent days as well. Also in Chironico, Adam Ondra stopped through and nabbed the 3rd ascent of Big Paw, yet another Dave Graham V15 which saw its second ascent only a few weeks ago. And in other Switzerland news, Paul Robinson sent the iconic Fred Nicole boulder Dreamtime (V14) on Thanksgiving day. According to this post on DPM, Chris Redmond has added a potential V12 to the rocks along the coast of Florida of all places. Watch some guy named Chris Sharma watch soccer, climb rocks and speak in a foreign language. Dean Potter and Sean Leary established a new speed record on The Nose of El Capitan earlier this month, but a subsequent attempt to improve on their time was thwarted by wetness near the top of the wall. Check out this article in the San Francisco Chronicle for a nice write-up on their record-breaking first push. Beth Rodden continues her recovery from shoulder surgery and shares a valuable lesson she learned about the importance of wearing a helmet. The photos in Simon Carter’s latest dispatch from the Red River Gorge make me want to drop what I’m doing, get in the car, and head to the Red. ← Video Friday: Lincoln Lake GIANTS! Looking at the images of the Devetashka Cave, I sincerely hope that no bolts or climbing ever appear in that cave, irregardless of it’s past usage. I think this is the first time I have ever seen a rock formation and felt this way. The Mandala Sit Start was originally graded V13 by Tony Lamiche. I agree with SP on this one. With a view toward the preservation of natural and heritage sites, some formations should just remain off-limits to climbing. I heard that Paul and Adam got in a fist fight on the topout of Big Paw. I heard it was a pretty fair battle. We took Paul to Chuck E Cheese to celebrate the send and the fight. Accidents like the Red Rocks one are why trad climbing scares me (yet I still do it). I’ve witnessed a friends gear coming out while I was attempting to photograph him on the climb. It hit him in the head on the way down too. Thankfully he was wearing a hemet and had a good belayer, the second piece of gear caught him. Apparently, this fall didn’t even result from gear coming out. It was just a runout section, and a hold broke. Even scarier. These recent top level sends are certainly not clearing up any grading confusion in the world of hard bouldering. Dave, certainly not known for over-grading, grades The Island V15. Nalle repeats, confirms the grade. Then two less well known european dudes send and call it V14 . . .
Dave does From Dirt Grows the Flowers, V15. Bernd Zangerl repeats, I’m not sure if he commented on the grade at all, but it doesn’t seem like he thought it was overgraded. Two recent repeats, and according to 27crags Mickey Page thinks it might hard V14. Dave does Big Paw, V15. Repeated by Dai and Ondra (two strong mother fuckers to be sure), who confirm the grade. Then P Rob repeats and says that is is “only” solid V14. The only thing that can be said for sure is that some hard, cool stuff is being climbed out there. Also, Dave Graham is a beast for putting up so much classic, hard stuff. A true visionary. I think most of this can be attributed to the undeniable fact that all of these climbers have different strengths and when you are talking about stuff at this level a certain move may suit a few of these guys but feel impossible for someone who has a different style or is 1″ shorter. If I understand things correctly this is why Chris Sharma never graded his boulder FA’s. Despite all of this I will continue to have a math-oriented mind and will think about numbers and grades whenever given the opportunity. Isn’t Paul’s ascent of Dreamtime the first since that hold broke a while back? What were his thoughts on it? Is it still V14 or did Paul think it was harder without that hold? This was at least the 3rd or 4th ascent since the hold broke. If you click the link where I mentioned Paul’s send you can read his thoughts on the climb. Manute bol is one of my favorite climbs at LRC. Was there for the first time last week. The stone quality is awesome.